The MailPro Anti Arson Mailbox/letterbox range offers a practical solution to foiling arson attacks, key Phishing Attacks and other anti social behaviour (such as the insertion of fluids, etc. ), perpetrated through the letterbox. ...or a box to fit on your external wall next to your door, (which will allow you to seal up the letterbox in your door), you will find a great solution among our MailPro range. All MailPro Internal units are designed to be leakproof as well as offering protection against fire attack, (and they can even help with you heating bill as they reduce draughts!). 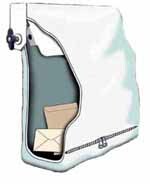 Robustly constructed from folded and welded steel sheet and finished with a durable white paint finish, this range fits over your letterbox on the inside of your door to provide a safe collection point for your mail, prevent unauthorised access to it and protect against arson attack or other forms of anti social activity that may focus around your letterbox. Available with single or dual ALF Extinguishers. Fits over your letterbox on the inside of your street door to collect and safely store mail delivered through your letterbox. Special fire protection feature to protect against arson attack, lockable to prevent unauthorised access to your mail, etc. 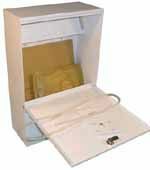 Like the MailPro Internal Steel Box range, these units are designed to fit over the inside of your letterbox. In tests, these robust units have performed well and have been subjected to a variety of rigorous tests including; fluid retention (4 litres / overnight), protection against various arson attacks featuring insertion of burning materials (with & without a petrol accelerator), insertion of lit fireworks (Rocket & Roman Candle). Fits over your letterbox on the inside of your street door ...the Ultra Slim design of this flame resistant and liquid proof unit makes it ideal for use where your door opens back against an internal wall. Installation of an external Mail Box means that you can seal your through the door or wall letterbox to your property, thus preventing any risk of attack trough your letterbox. The MailPro range includes budget priced mail collector boxes as well as the Executive Range which incorporate an internal fire detection and extinguisher system. Designed to be installed on the outside of your building to collect your mail so that you can seal your through-the-door / wall letterbox. These galvanised and painted weather resistant units feature an internal fire detector extinguisher. ...allowing you to seal your vulnerable through-the-door or through-the-wall letterbox. Need advice on which MailPro product will best suit your requirements? ...please call our customer support team on: 01273 475500 , our advisors will be pleased to help.